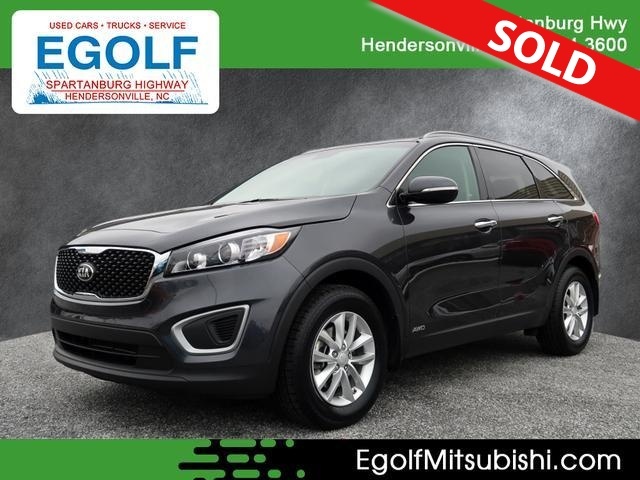 2016 KIA SORENTO LX, AWD, ONE OWNER, LOCAL TRADE, CLEAN AUTOCHECK HISTORY REPORT, AUTOMATIC TRANSMISSION, POWER EQUIPMENT GROUP, ALLOY WHEELS AND MUCH MORE. PLEASE CONTACT EGOLF MITSUBISHI SALES AND SERVICE @ 828-694-3600 FOR MORE INFORMATION AND TO SCHEDULE YOUR TEST DRIVE TODAY @ 1325 SPARTANBURG HIGHWAY, HENDERSONVILLE NC 28792. FINANCING AVAILABLE FOR ALL CREDIT TYPES!! The Kia Sorento is bigger, more sophisticated and better to drive for 2016, making it an appealing alternative to five- and seven-passenger SUVs that were previously a class above it. Kia's midsize crossover is definitely worth a long look. The Kia Sorento has been completely redesigned for 2016. User-friendly controls; well-made and attractive cabin; versatile second-row seat; ample features for the money; long warranty; excellent crash test scores. As the titular Malcolm would attest, it can be tough being in the middle. And yet, the Kia Sorento has done just fine occupying a middle ground between compact and midsize SUVs. For 2016, a completely redesigned Sorento carries on this tradition, but its needle now swings a bit from one side off-center to another. See, the previous-generation Sorento could be viewed as a slightly bigger alternative to compact SUVs like the Toyota RAV4, with similar interior quality and driving dynamics to match. The 2016 Kia Sorento, on the other hand, grows up literally and figuratively to become more of a smaller alternative to larger, more sophisticated family crossovers like the Toyota Highlander. And given its available five- and seven-passenger configurations, it's also more akin to two-row midsize crossovers like the Ford Edge while still undercutting them on price. The Kia Sorento has grown for 2016 and offers more interior space than before. These changes for 2016 go beyond greater interior and cargo room. In fact, those increases are rather negligible compared to the increases in interior and driving refinement. Simply put, the 2016 Sorento is a higher-quality vehicle. Cabin materials give up little (if anything) to pricier competitors, feature content embodies the term "generous" and even the styling is more attractive inside and out. Mechanical improvements include a strengthened structure, upgraded suspension and improved steering, which together create a more substantial, comfortable and altogether more refined driving experience. A turbocharged four-cylinder engine also joins the lineup to be its own middle ground between the underpowered base four-cylinder and thirstier V6 engines, though it's only offered with two-row seating, oddly enough. Overall, we're impressed by the 2016 Kia Sorento. This Kia is a strong, value-rich alternative to five-passenger crossovers like the Ford Edge, Hyundai Santa Fe Sport and Jeep Grand Cherokee, as well as seven-passenger models like the Hyundai Santa Fe and Toyota Highlander. It may still be stuck in the middle, but that's quite alright. The 2016 Kia Sorento is a midsize SUV available in five- and seven-passenger configurations as well as five trim levels: L, LX, EX, SX and SX Limited. Note that the L model and all Sorentos equipped with the midrange turbocharged engine are five-passenger only, while V6-powered Sorentos are seven-passenger only. The four-cylinder LX can be had with either seating configuration. The base L comes standard with 17-inch alloy wheels, LED running lights, three-mode drive settings (altering steering and transmission shift points), air-conditioning, cruise control, stain-resistant fabric upholstery, a tilt-and-telescoping steering wheel, 40/20/40-split second-row seats (fold, slide and recline), Bluetooth phone and audio connectivity, a CD player, satellite radio, an auxiliary audio jack and a USB/iPod interface. The LX adds automatic headlights, a sound-reducing windshield, roof rails, a rearview camera, Uvo eServices, a 4.3-inch touchscreen interface and two rapid-charge USB ports. The Convenience package adds rear parking sensors, an eight-way power driver seat (plus two-way power lumbar), heated front seats, a leather-wrapped steering wheel and an auto-dimming mirror. The third-row seat can be added to the Convenience package. The EX includes the Convenience package items and adds 18-inch wheels, sound-reducing front side glass, dual-zone automatic climate control and leather upholstery. Its Premium package adds a hands-free power liftgate, keyless ignition and entry, power-folding mirrors, blind-spot and rear cross-traffic warning systems, second-row side sunshades and a display screen speedometer/trip computer. The Touring package can be added to the Premium package and includes a panoramic sunroof, an 8-inch touchscreen interface, a navigation system, traffic reporting, a larger rearview camera display and a 10-speaker Infinity sound system with Clari-Fi digital music improvement technology. The SX includes the Premium and Touring package equipment and adds upgraded steering, 19-inch wheels, LED taillights, upgraded exterior trim, a 10-way power driver seat (plus four-way power lumbar), driver memory settings, a fabric headliner and an auto-dimming rearview mirror. The SX Limited adds chrome-clad 19-inch wheels, upgraded leather upholstery, ventilated front seats and heated second-row outboard seats. The available Technology package adds xenon headlights, a multi-angle parking camera, an electronic parking brake, adaptive cruise control, and lane-departure and forward collision warning systems. Everything in the cabin feels high-quality, from the clean center stack design to the richly textured two-tone seating surfaces. Standard on the 2016 Kia Sorento L and LX trim levels is a 2.4-liter four-cylinder engine that produces 185 horsepower and 178 pound-feet of torque. As with every Kia Sorento, a six-speed automatic and front-wheel drive is standard, while all-wheel drive is optional. EPA fuel-economy estimates stand at 24 mpg combined (21 city/29 highway) with front-wheel drive and 23 mpg combined (21 city/26 highway) with all-wheel drive. Towing capacity is 2,000 pounds. The EX and SX Limited are available with a 2.0-liter turbocharged four-cylinder engine that produces 240 hp and 260 lb-ft of torque. In Edmunds testing, an all-wheel-drive SX Limited with the turbo engine loped to 60 mph in 8.7 seconds, a leisurely performance given those healthy output numbers. EPA-estimated fuel economy is 23 mpg combined (20/27) with front-wheel drive and 22 mpg combined (19/25) with all-wheel drive. Towing capacity is 3,500 pounds. A 3.3-liter V6 engine is mandatory on the SX and available on the EX and SX Limited. It produces 290 hp and 252 lb-ft of torque. In Edmunds testing, an all-wheel-drive SX hit 60 mph in 7.6 seconds, an adequate showing for a V6-powered crossover in this class. The EPA estimates fuel economy at 21 mpg combined (18/26) with front-wheel drive and 19 mpg combined (17/23) with all-wheel drive. Towing capacity is 3,500 pounds with front-wheel drive and 5,000 pounds with all-wheel drive. Notably, a turbocharged SX Limited achieved 23.6 mpg on our standardized 120-mile driving loop, while the V6-motivated SX returned 23.3 mpg. These results suggest that the turbo engine's real-world advantage in fuel economy may be even smaller than the EPA estimates indicate. Every 2016 Kia Sorento comes standard with antilock brakes, traction and stability control, front side airbags, and front- and second-row side curtain airbags. Optional on the LX and standard on the EX, SX and SX Limited are a rearview camera, rear parking sensors and Uvo eServices (geo-fencing, speed alert and curfew alert for secondary drivers). Blind-spot and rear cross-traffic warning systems are optional on the EX and standard on the SX and SX Limited. The SX Limited can be equipped with the Technology package, which includes lane-departure and forward collision warning systems. In Edmunds brake testing, an SX Limited with the turbo engine stopped from 60 mph in 118 feet, a shorter-than-average distance. A V6-powered SX needed 121 feet, which is about average. In government crash tests, the 2016 Sorento received the top five-star rating for overall crash protection, with five stars for total front-impact protection and five stars for total side-impact protection. Likewise, the independent Insurance Institute for Highway Safety awarded the 2016 Sorento the best possible score of "Good" in the small-overlap frontal-offset, moderate-overlap frontal offset, side-impact and roof-strength tests. The Sorento's seat and head restraint design was also rated "Good" for whiplash protection in rear impacts. Most surfaces in the 2016 Kia Sorento are now soft to the touch and richly textured, while available two-tone color schemes accentuate these quality materials. There's now enough of a premium look and feel that higher trim levels seem properly luxurious. Much of the same can be said for the appealing design, which nevertheless features user-friendly controls. Either of Kia's touchscreen interfaces represents one of the simpler electronics interfaces around, with big virtual buttons and clear labeling. The Sorento's infotainment system is easy to use thanks to plenty of physical buttons and knobs. Just as notably, however, are the gains made in passenger space for 2016. The second row gains a half inch of legroom, while being able to slide, recline and fold flat via levers in the cargo area. This versatility is present regardless of seating configuration, which isn't always the case in competing SUVs. As for the third-row seat, kids and smaller adults have additional space and it isn't the penalty box you'd imagine; however, larger crossovers like the Toyota Highlander do have more adult-friendly space (as well as seatbelts for eight). Cargo capacity behind the third row has grown (11 cubic feet), though it's still really only good for a pair of small suitcases or several grocery bags. There's a healthy 38.8-cubic-foot cargo bay behind the second-row seat, with maximum capacity hitting 73.5 cubes when you fold the second row. That's more than you'll find in most five-passenger midsize SUVs, but less than what larger three-row crossovers offer. There is a sense of sophistication to the 2016 Kia Sorento's ride that its predecessors lacked, as even top-of-the-line models with their big 19-inch wheels manage to soak up bumps without harshness. Kia's midsize crossover is also impressively quiet, especially in the EX trim and above, so count the Sorento as a good candidate for a comfortable family road trip. Every Sorento comes with Driver Mode Select, which features three modes (Normal, Sport and Eco) that alter transmission shift points and steering effort. Although we could detect the changes in the former, it was difficult to differentiate between the steering settings. It's important to note, though, that the SX and SX Limited actually have a different steering system that should yield a greater sense of precision than the other trims. We found it to perhaps be a little light, but indeed suitably precise and confidence-inspiring for this class of vehicle. We prefer the Sorento with the V6, as both four-cylinder engines have some disadvantages. The base four-cylinder engine doesn't have a lot of power to adequately motivate the Sorento's not-inconsiderable size and weight. Opting for the V6 engine is recommended, as its 290 hp is certainly better suited to a vehicle of this size. If you can live without seven seats, the new turbocharged four-cylinder may appeal as an in-between option, but it lacks the low-end punch we've come to expect from modern turbo engines.